Deutsche Bank and UBS have shown there is life in Europe’s bond traders yet. The two banks and Credit Suisse have been losing share to Wall Street since last year, but in the second quarter they hit back. Fixed-income revenue at Deutsche was flat year-on-year, and down just 2 percent at UBS – against a 9 percent average fall at American banks. Deutsche is doing better because of favourable European credit conditions. The bank struggled in flow-based foreign-exchange and interest-rate trading – as peers did – but lively markets in Europe for distressed and commercial real-estate debt helped offset the pain. Swiss peer Credit Suisse recently benefitted from the same dynamics: its fixed-income top line jumped 4 percent year-on-year. Once U.S.-centric, it now derives a quarter of its credit revenue from Europe. UBS, meanwhile, has avoided humdrum markets by changing the way it does flow business. Greater investment in electronic trading helped it to raise second-quarter FX revenue by 13 percent year-on-year, says a person familiar with the bank. It helps that UBS and Deutsche are now more resilient. Both have Basel III equity-to-assets ratios above the minimum 3 percent threshold. That benefits fixed income, given its reliance on gearing up the balance sheet. Strategically there’s a big difference, though. UBS hacked back its fixed-income business two years ago: its 2014 second-quarter revenue was barely a third of the level in the same period of 2012. Deutsche Bank, in contrast, is still growing. Raising 8.5 billion euros ($11.6 billion) of equity in June enabled it to grow its investment banking loan book by 6 billion euros in risk-weighted assets. The danger is that with almost a quarter of second-quarter group revenue sourced from debt trading – versus 5 percent at UBS – Deutsche is more exposed to FICC. The potential for greater top-line volatility partly explains why Deutsche trades at a 40 percent discount to forecast book value compared to UBS’s 20 percent premium. 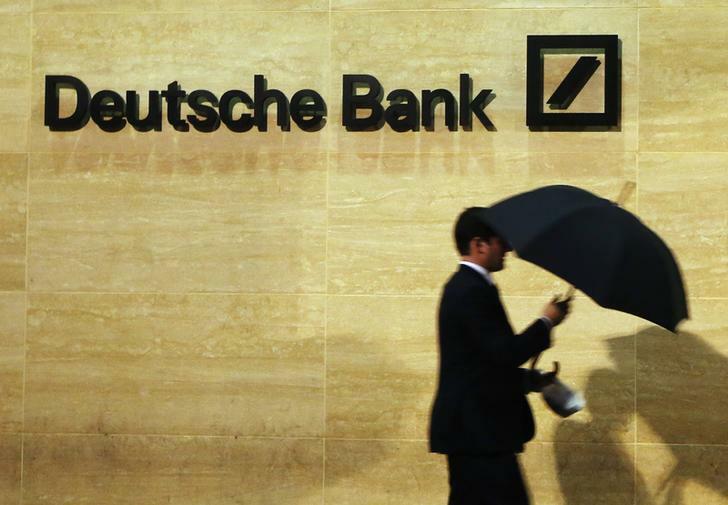 Another reason is Deutsche’s larger litigation issues – FX and dark pools are a risk for both banks, but Deutsche still hasn’t settled for Libor. But next year volatility could have recovered from its cyclical lows, and flow-based fixed income could pick up. If so, Deutsche will look smart, and UBS will need to prove that its investment bank’s high return on equity is sustainable. For the moment, they are helping European traders’ bruised egos to recover. Deutsche Bank on July 29 said it made 238 million euros ($263 million) in quarterly net profit, down 29 percent on the previous year as a higher tax charge offset a 16 percent rise in pretax profit. Revenue was flat year-on-year in the bank’s global transaction banking unit, flat in its asset and wealth management division excluding a one-off life insurance gain, and down 3 percent in its private and business clients segment. Deutsche’s investment banking division saw its top line slip 1 percent, but within that fixed-income trading was flat year-on-year. At group level, Deutsche cut its compensation costs by 7 percent from the first quarter of 2013. UBS on July 29 reported quarterly net profit of 792 million Swiss francs ($876 million), up 15 percent from a year earlier, as falling costs more than offset a 3 percent decline in revenue. Revenue in the Swiss bank’s wealth management, asset management and retail and corporate businesses all fell. However, UBS grew its top line in its wealth management business in the Americas by 7 percent. UBS’s investment bank held its top line steady, with revenue from foreign exchange, rates and credit products falling just 2 percent to 355 million Swiss francs year-on-year. The Zurich-headquartered bank also took a 254 million Swiss franc charge in the second quarter, chiefly to settle claims it helped wealthy Germans evade taxes. Deutsche said it had received requests from unnamed authorities relating to high-frequency trading. UBS said it had been approached by authorities including the U.S. Securities and Exchange Commission, the New York Attorney General and FINRA about the operation of its “dark pool” equities trading platform. Both banks said they were among the many defendants named in a putative class action lawsuit in New York related to high-frequency trading. UBS shares fell 0.8 percent to 16.49 Swiss francs by 1000 BST. Deutsche Bank shares rose 0.5 percent to 26.80 euros.